In the 20th century AD there were more Christians killed because of their faith in the Jewish Messiah than in all the centuries of Christian persecution combined. 65% of all Christians who have ever been persecuted or martyred lived in the years from 1900-2000. Antonio Socci, an Italian journalist, estimates that 45 million Christians were martyred in the 20th century. The New Persecuted: Inquiries into Anti-Christian Intolerance in the New Century Of The Martyrs. This number is considered high by some. 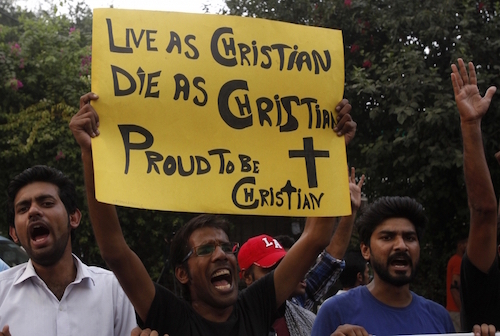 Most of the organizations that monitor human rights and Christian agencies that calculate Christian persecutions and deaths estimate the number of Christians killed in the last century as 15-20 million—still a shocking number. The 20th century commenced with the Massacre of the Armenian Christians beginning on April 24, 1915 and continuing in the years after World War I. The Turkish Muslim government decided that the Christian “race” was a danger to their national unity. In order to settle what they called “the Armenian question,” they systematically killed 1.5 million Christian Armenians. 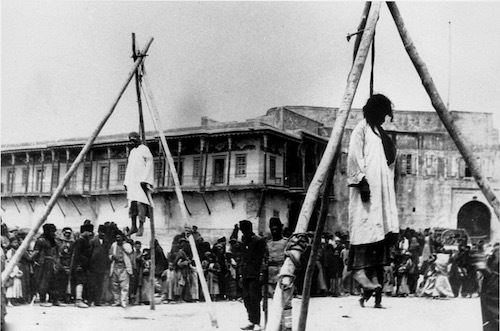 A crowd looks on as Christian Armenians are hanged in the street in Constantinople before their forced removal to the desert. Their genocide began after April 1915. When the atheist Communists took over Russia in 1917, they spent the next seven decades deliberately suppressing, exiling and killing an estimated 20 million Christians (17 million Russian Orthodox and 3 million Roman Catholic). Russian Christians killed by atheist Communists started March 8, 1917. 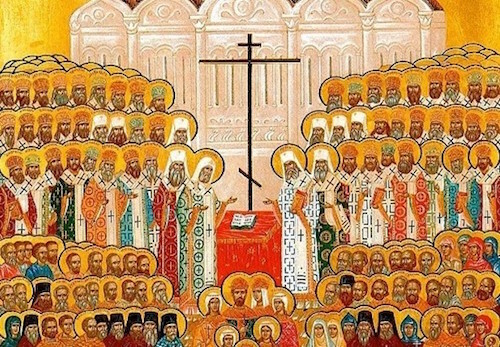 The Russian Orthodox Church canonized more than two thousand clerical martyrs of communism. After the Communist revolution in Mexico and the new Constitution in 1917, the atheist government began a vigorous campaign against the Catholic Church. The State outlawed religious orders, took away the clergy’s right to vote and restricted rights to worship. A people’s army, the Cristeros (Fighters for Christ), rose up against the atheists and more than 30,000 of them were killed. The army was led by General Enriques Gorostieta (left) from 1926-1929. 40 priests were assassinated between 1926-1934. By the end of 1934, there were only 334 priests licensed to minister to 15,000,000 Mexicans. In Spain 13 bishops, 4,172 priests and seminarians, 2,364 monks and 283 nuns were killed by atheist Leftists during the Spanish Civil War (1936-1939). 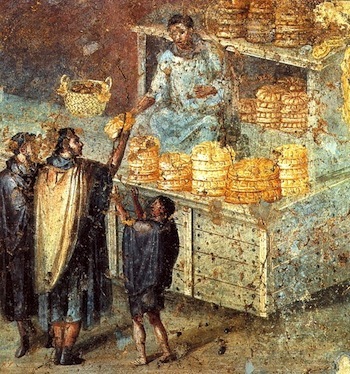 Synagogues, Protestant churches and Catholic churches were burned, pillaged or closed. 150,000-400,000 people who opposed Franco were killed. In Franco’s Fascist Spain (1939-1975), the country’s 30,000 Protestants were persecuted and many were forced to leave the country. 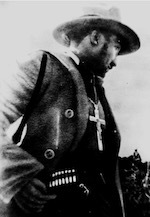 All non-Catholic Bibles were prohibited and were confiscated by the police. 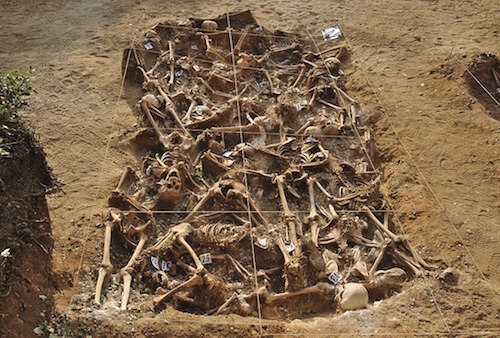 One of the mass graves, dating from the start of the Spanish Civil War (1936-1939), recently discovered in an excavation from July–August of 2014 at Estepar (Burgos). The grave contains twenty-six Christians who were killed by the fascists in August-September 1936. 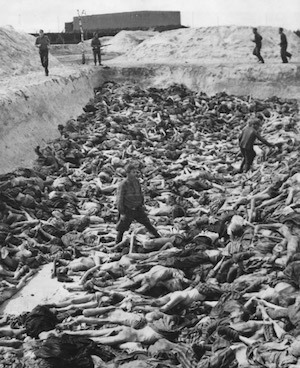 A mass grave of Jewish corpses at the Nazi Bergen-Belsen concentration camp. When Hitler came to power in Germany in 1933, his avowed purpose was “to settle the Jewish question” forever. When Titus had destroyed Jerusalem in 70, the Romans felt they “had settled the Jewish problem” forever. Before World War II there were 9,000,000 Jews living in Europe. When World War II was over, there were 3,000,000 Jews in Europe. Hitler had killed 90% of the Jews in Poland; 70% of the Jews in Yugoslavia, Hungary, the Netherlands and Greece; 50% of the Jews in Norway, Estonia, Romania and Belgium; over 30% of all the Jews in Russia and 25% of the Jews in France and Italy. The Nazis killed two out of every three people who were of the same race and ethnicity as was Jesus of Nazareth. Germany was a nominally Christian country. The Nazis first forced believing Christians underground. They became the Confessing Church. 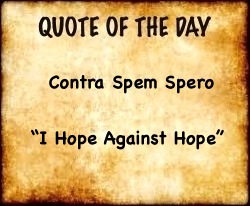 When the Confessing Church was taken to the death camps, there was no longer a Christian opposition to Hitler. The German people, like the Turkish people during the Armenian genocide, went along with the Nazis even when the killings included their Christian neighbors, Gypsies, Communists, the mentally handicapped (target of the Euthanasia Project), homosexuals and Jehovah’s Witnesses. Hitler and the Nazi ideology were antithetical to both God and the better angels of human nature. In trying to build a Darwinian/Nietzschean race of tall, blue-eyed, blond-haired people, the 5’9”, dark-haired, brown-eyed Hitler (right) massacred 60,000,000 people all over Europe. His experiments in conquest and eugenics should have been a final lesson to mankind. They were not. During Mao Zedong’s ten-year Cultural Revolution Of The Proletariat (1966-1976), it is estimated he killed from 45-70 million Chinese. People who wore glasses were killed because they knew how to read and cared about learning. Untold numbers of Christians were killed because they were theists and would not renounce their faith in Christ. The atheist Communist “Great March Forward” ended with Mao’s death in 1976. In the decades following his death, however, the number of Christians in China has exploded to between 60-80 million believers. The Christians in China are today the largest single persecuted Christian community. The Christian church at Xingsha Ecological Park in Changsha, China. 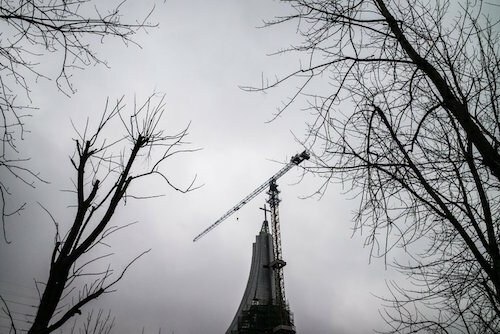 At 260 feet tall, it is bigger than the nearby largest statue of Mao Zedong in China. Battle Hymn of the Republic sung by the United States Army Field Band—over 3.5 million views.